Free Shipping Included! 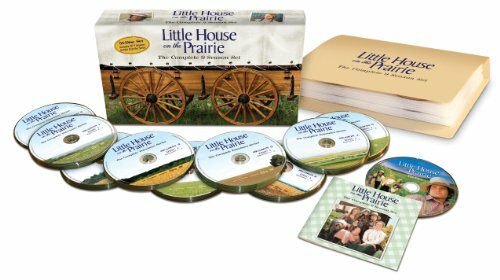 Little House on the Prairie: The Complete Nine-Season Set (Complete Series + Pilot Episode) by LionsGate at Chocolate Movie. Hurry! Limited time offer. Offer valid only while supplies last. When Little House on the Prairie made its television debut in September 1974, it captured the hearts and imaginations of families across the country. When Little House on the Prairie made its television debut in September 1974, it captured the hearts and imaginations of families across the country. A top-rated series throughout its nine-season run, the timeless show's themes of love, discipline, morality and strong values continue to resonate with viewers around the world through its continued syndication. Nominated for 17 Emmy and three Golden Globe awards during its original TV run, Little House on the Prairie was based on the best-selling books by Laura Ingalls Wilder that documented the extraordinary adventures of a young pioneer family's struggle to build a new life for themselves on the lawless American frontier of the 1870s.